“The Customer is the most important visitor of our premises” quoted by M.K. Gandhi and practiced by Council For Fair Business Practices (CFBP), the prestigious organization which was founded in 1966 by stalwarts of business & industry like Mr. J. R. D. Tata, Mr. Ramkrishna Bajaj, Mr. Arvind Mafatlal, Mr. F.T. Khorakiwala, Mr. Naval Tata, Mr. S.P. Godrej, Mr. J.N. Guzder and Keshab Mahindra and others who recognized the imperative need of business & industry to regulate itself. 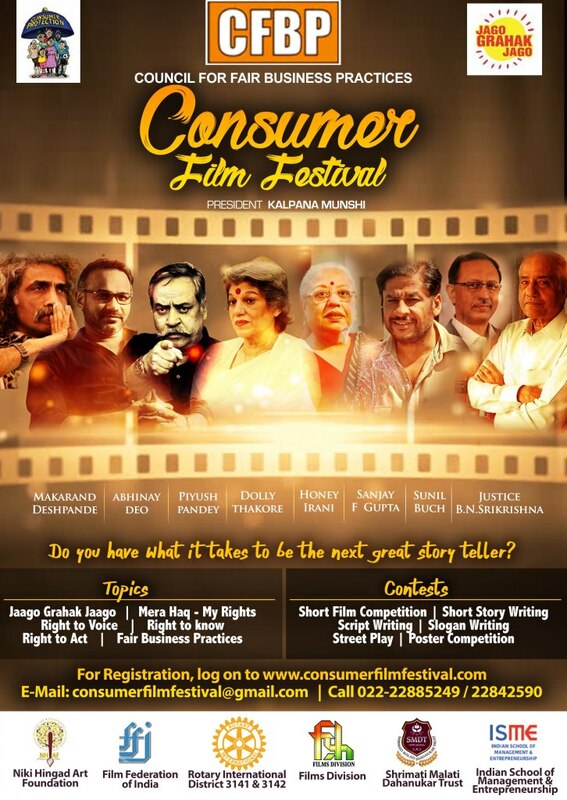 CFBP now gives a chance to the budding movie makers and invites them to send their entries to ‘Consumer Film Festival’ on any of the following topics mentioned below as this could be a platform for them not only to get recognition but also opportunities. It’s a cause for the benefit of the consumers which could be any one of us any gender any age any city of India. Justice BN SriKrishna: Bellur Narayanaswamy Srikrishna is an Indian jurist and a retired Judge of the Supreme Court of India. From 1993–98, he headed the well-known Commission of Inquiry, the “Srikrishna Commission” as it became known, which investigated causes and apportioned blame for the Bombay Riots of 1992–93. He is currently the chairman of the Financial Sector Legislative Reforms Commission (FSLRC). Mr. Piyush Pandey: Named the most influential man in Indian advertising for eight consecutive years by The Economic Times, Piyush Pandey is an award-winning co-executive chairman and national creative director of Ogilvy & Mather India and vice-chairman of O&M Asia-Pacific. His notable ad campaigns include the BJP Election Campaign 2014, Cadbury’s, Fevicol, Vodafone and Asian Paints to name a few. The Government of India awarded him the civilian honour of the Padma Shri in 2016. Ms. Honey Irani: Three Time Filmfare Award Winner, Honey Irani is a former actress and a legendary screenwriter known for her work in some of Bollywood’s most iconic films like Lamhe, Darr, Aaina, Kaho Naa… Pyaar Hai, Kya Kehna, Krrish and Krrish 3 to name a few. Mr. Abhinay Deo: Abhinay Deo is a Screenwriter and a Commercial / Feature Film Director. He made his debut with the film Delhi Belly which was a smash hit earning him a Filmfare Award for Best Director Debut. He has gone on to direct Game, Force 2, 24: The Series and he will be directing the upcoming Force 3. Mr. Sanjay F Gupta: Sanjay F Gupta is an award winning Cinematographer and Film Director whose work in the Indian Film & Music Industry and has spanned over a period of 25 years. From Alisha Chinoy’s Made in India to Akshay Kumar’s Singh is Kinng and Welcome, they were all shot through the lense of Sanjay F Gupta. Mr. Makarand Deshpande: Makrand Deshpande is an award winning Actor, Writer and Director who has appeared in various successful films like Jungle, Sarfarosh, Guzaarish, Swades, Makdee and Darna Zaroori Hai and is a stalwart the Hindi, Kannada, Marathi, Telegu and Malayam Film Industry. He has also contributed significantly to Indian Theatre through the Ansh Theatre Group, which he has been running for the last 34 years. Ms. Dolly Thakore: Dolly Thakore is a veteran Theatre Actor, Casting Director and former News Anchor whose work in the Theatre world has been nothing less of revolutionary. Her work as a casting director started with Richard Attenborough’s Gandhi. Since then she has worked on a number of Indian and international co-productions like Far Pavilions, Kim, Indiana Jones and the Temple of Doom, Jinnah, and Such a Long Journey. Mr. Sunil Buch: Sunil Buch is the CEO ZEE LIVE & ZEE Talent | Head – Corporate Brand & Communications. Responsible for driving the LIVE Events, Theatre and Talent businesses, that are beyond the mainstay of broadcasting, Sunil plays a key role in leveraging content assets across ZEEL’s ecosystem. The contest, which is open to Professionals, Film makers, Companies, Corporates, Organizations, Students, Individuals, young upcoming stars and NGO’s will be headed by a jury of 8 members. The winner in all the 6 competitions will be awarded with the Cash prize, a trophy and a certificate from the Chief Guest on the day of the Award function. Further details on the registration process as well as the terms and conditions for each section will be available on the Consumer Film Festival website, consumerfilmfestival.org.